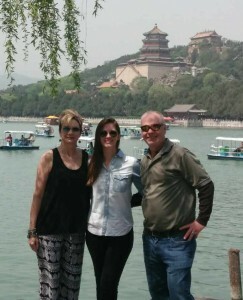 Tour Description: You will find our English-speaking tour guide waiting for you at the arrival hall of Beijing airport, holding a paper sign with your name on. Drive about 1 hour to the beautiful royal garden-Summer Palace, where the Chinese emperors and their concubines spent their leisure life. Drive back to airport after the trip. Hello. I have an 8 hour layover in Beijing – but it’s mostly at night. I arrive at 4:10pm in the afternoon and leave at 12:40 am the next day. Is there a tour that would work with these arrival and departure times? Your arrival time is too late. We do not have tours by then. Sorry about that! Thank yo for contacting us! We just sent you an email about detailed tour timeline and price, please check. Our party of 3 adults (myself, my husband, and my mom) will be arriving in PEK on 10/30 at 2:15 pm for a 24 hour layover departing 10/31 at 2:15pm. We are interested in visiting the summer palace. Is this possible within our timeframe? According to your layover time, you can visit the Summer Palace on Oct. 30, 2017 afternoon or Oct. 31, 2017 morning. We have sent you an email about detailed tour itineraries, please check. I will be passing through Beijing arriving Oct 21, 2016 at 8:05 AM. Departure Oct 21 at 12:20 PM. And then I also have another trip later in November 18, 2016 arriving at 5:55 PM, and leaving the next morning November 19 at 8:35 AM. I was wondering what possible tours do you have available for both these trips? 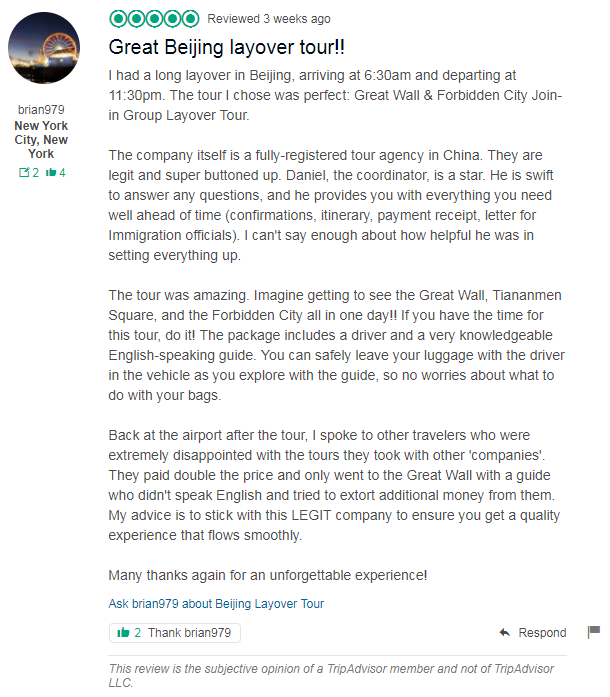 Both of your layover time in Beijing are not suitable for tours. Sorry about that! 2 of us arrive to Beijing from SFO at 2:20PM and we leave for Mongolia at 9:10PM. As is is late in the day I understand sites may be closed. I am not sure what sort of tour we could do and am open to your suggestions. According to your flight times. I recommend you visit Hutongs with rickshaw. We just sent an email to you, please check it out. I am travelling through Beijing on 27 January with a layover of 7 hours and returning on 4 March with a similar length layover. I am keen to use this time to see the sights of China – particularly The Great Wall, Tiananmen Square and The Forbidden City. Is this something you could accommodate? If so, what is the cost? Thank you for your message. Our travel advisor has been sent an email about detailed itinerary and price to you, please have a look.